Your Hawaiian word for the day is pua’a, or pig. This year in the Chinese zodiac/horoscope is the year of the boar or pig. 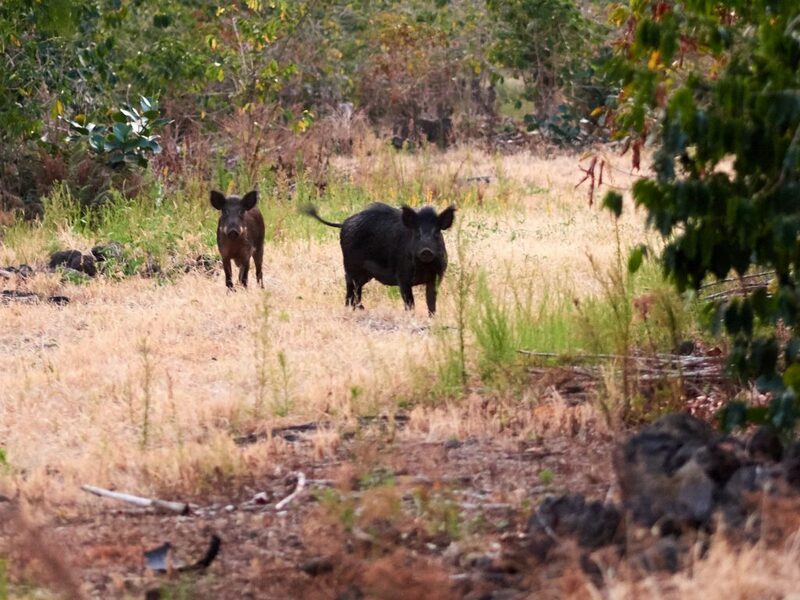 Pigs in our coffee land a few years ago. We are being visited by them again. They come and go all the time. The most we’ve seen is a family of nine a few years ago. Often we don’t see them, we just hear them at night or in the morning, but mostly we just see their path of destruction. They root around and rototill. When I’ve gone to coffee farming workshops inevitably someone goes off topic and asks about how to deal with pigs. There’s no clear answer, though it sounds like electric fences might be the best way. We tried to trap them. That became a daily experiment of setting out foods we thought would entice the pigs only to find the next day the offering untouched or taken by a smaller animal. We weren’t successful, but it was fun to try for a while. Our cousins were successful one time though! Then there was the problem of what to do once you have a distressed, squealing pig at 1 AM. One friend who has land close to a pig highway has been practicing his bow and arrow skills. And just after I heard him complain about what a poor aim he was, a few days later he got one! The brazen pigs had access to lots of open space and land, but several chose to keep visiting and digging up the courtyard area by his guesthouse, maybe 10 feet from bedrooms! My friend got another one less than a week later. He had never dealt with a dead pig, but he processed it all based on what he learned from YouTube videos!! Amazing!! He was up until 2am the first time, I think. He’s a modern homesteader, do-it-yourselfer. There was a time my husband and I would save pineapple tops, let them rest atop water until they grew roots, then we’d plant them in the ground. We don’t really have a lot of loose soil. 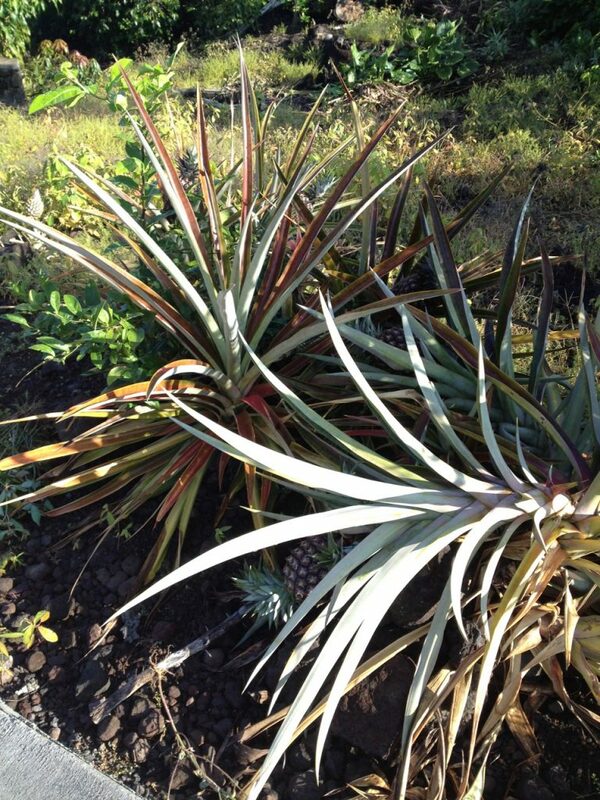 We’d have to dig around to find some dirt, and hold the pineapple plantings in place with some lava rocks. One day my husband planted around seven. The next day all of them had been dug up by pigs. We even used Uncle Harold’s technique … laid a big, thorny citrus branch cutting over our pineapple to keep the pigs away. But like so many situations in Hawaii, you try to solve one problem, and you create others. If that cutting touched any dirt, it’d often root! When we haven’t stayed on top of it, some of those cuttings became 5-foot tall, thorny, citrus bushes! 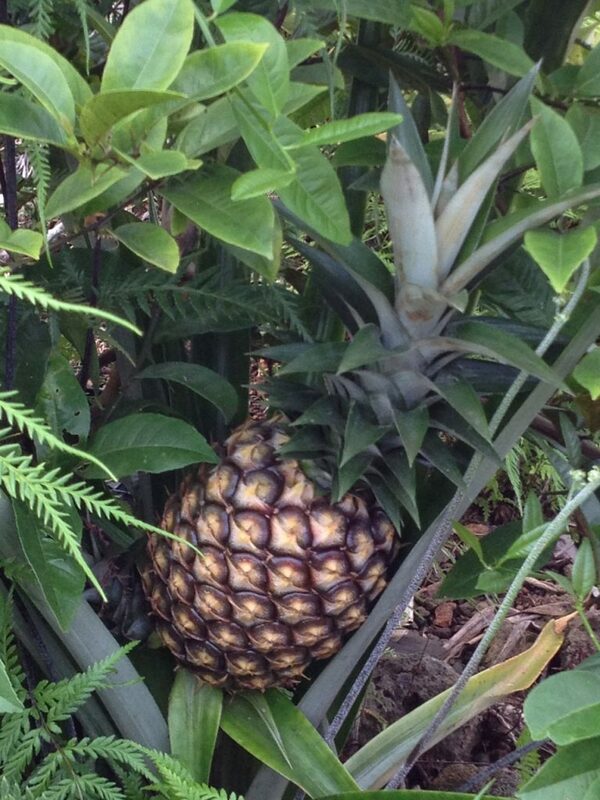 Note the citrus growing behind the pineapple on the left.